Height: 8′ Width: 15′ A children’s room in La Jolla, CA, where every room in the house had a view of the ocean except the children’s room. Their view is now of the Serengeti. At night, when the lights go off, all of the animals’ lights light up! 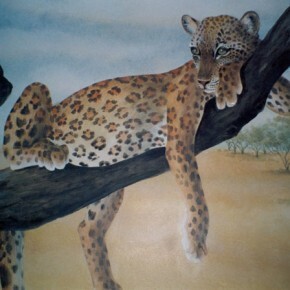 Height: 8′ Width: 15′ A detailed view of a leopard hanging in the tree above zebras. 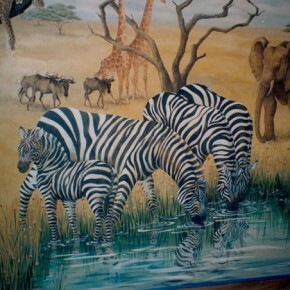 A mural in a child’s room in La Jolla, CA. © 2013 Lucinda Hayes. All Rights Reserved.